Third Row Seat, Heated Leather Seats, 4x4, Aluminum Wheels, Premium Sound System, Satellite Radio, Running Boards, Rear Air, Trailer Hitch, TRANSMISSION, 4-SPEED AUTOMATIC, SUPE..., Consumer Guide Best Buy SUV. CLICK NOW! Leather Seats, Third Row Seat, 4x4, Rear Air, Heated Driver Seat, Running Boards, Premium Sound System, Satellite Radio, Onboard Communications System, Trailer Hitch, Remote Engine Start, Dual Zone A/C, Heated Seats, Heated Leather Seats Rear Seat Audio Controls, Keyless Entry, Privacy Glass, Steering Wheel Controls, Rear Parking Aid. WHEELS, 4 - 20 X 8.5 (50.8 CM X 21.6 CM) POLISHED ALUMINUM (Includes (QSS) P275/55R20 all-season blackwall tires. SUSPENSION PACKAGE, AUTORIDE, BI-STATE VARIABLE SHOCK DAMPENING AND REAR AIR-ASSISTED LOAD-LEVELING includes (G69) automatic air level control, ENGINE, VORTEC 6.0L VARIABLE VALVE TIMING V8 SFI with Active Fuel Management (366 hp [272.9 kW] @ 5500 rpm, 380 lb-ft of torque [513.0 N-m] @ 4300 rpm), aluminum block, DIFFERENTIAL, HEAVY-DUTY LOCKING REAR, TRANSMISSION, 4-SPEED AUTOMATIC, SUPER-DUTY, ELECTRONICALLY CONTROLLED with overdrive and tow-haul mode, AUDIO SYSTEM, AM/FM STEREO WITH MP3 COMPATIBLE 6-DISC IN-DASH CD CHANGER seek-and-scan, digital clock and auto-tone control and auxiliary audio input jack (STD). 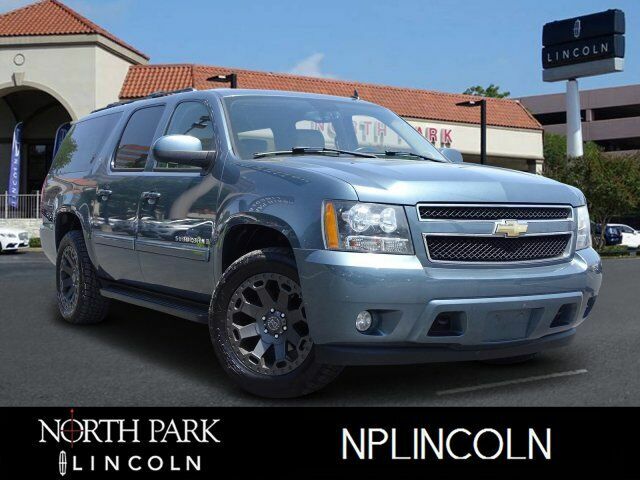 2008 Chevrolet Suburban with BLUE GRANITE METALLIC exterior and LIGHT CASHMERE/EBONY interior features a 8 Cylinder Engine with 366 HP at 5500 RPM*. 5 Star Driver Front Crash Rating. 5 Star Passenger Front Crash Rating. Edmunds.com`s review says The Chevrolet Suburban is still virtually unmatched when it comes to space and utility.. WHEELS, 4 - 20" X 8.5" (50.8 CM X 21.6 CM) POLISHED ALUMINUM (Includes (QSS) P275/55R20 all-season blackwall tires.